Posted on November 1, 2011 by IASUS_CONCEPTS wrote in Press Release. It has 0 Comment. If you are always on the go and wearing headphones that might not offer you the kind of power you want from your music, iASUS has a new amp for mobile use that will increase the power of any headphones. 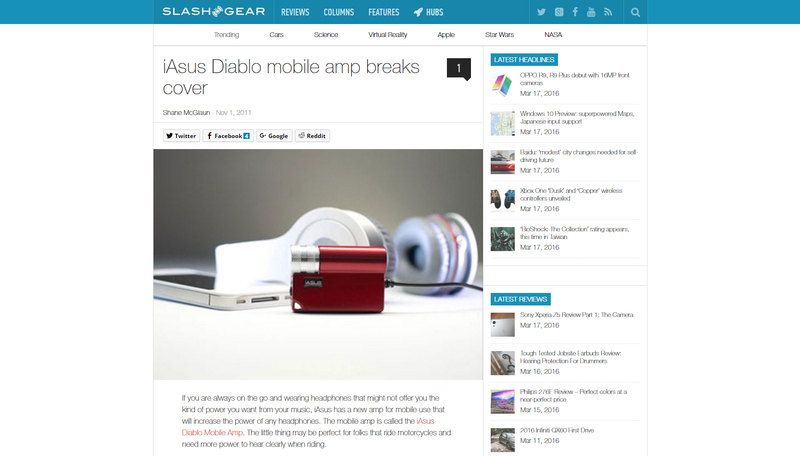 The mobile amp is called the iASUS Diablo Mobile Amp. The little thing may be perfect for folks that ride motorcycles and need more power to hear clearly when riding. The Diablo amp is a limited edition device that is very small and has no power cap. The original Diablo had a power cap for use with ear buds. The downside to no power cap for ear bud wearers is that the limited edition amp can break ear buds with too much power. The device also claims that it can improve the battery life of mobile media devices by as much as 50%. The amp has a machined volume knob and a metallic red casing with LED charge indicator light. It has an internal rechargeable battery good for up to 20 hours per charge and charges via USB. The amp also has dual output so you can share the music with two people. The device will sell for $99 and will ship on November 25.